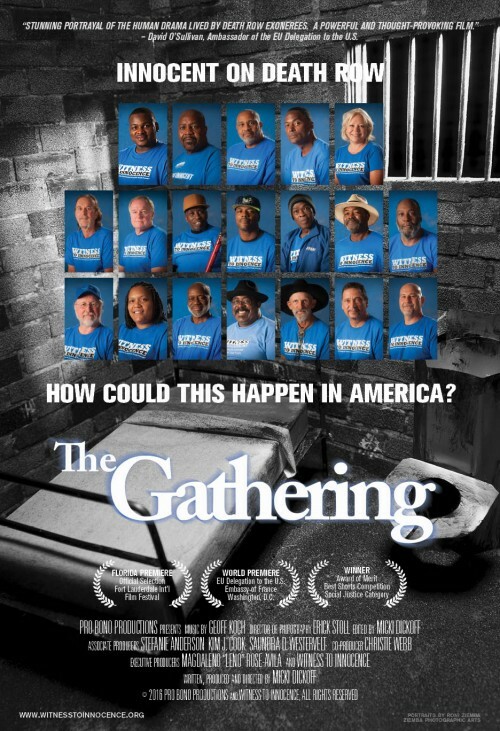 The award-winning documentary “The Gathering” tells the story of Witness to Innocence, the only national organization of exonerated death row survivors and their families. These innocent men and women gather once a year to share their harrowing nightmare with the only people who really understand their experience. The exonerees empower each other, speaking out against a broken justice system and compelling them to be warriors against the death penalty. They know the risk of executing an innocent person is too high. Director Micki Dickoff and executive producer Magdaleno Rose-Avila will be joined by death row exoneree Juan Melendez for the Q&A after the screening. Juan was wrongly convicted in Florida, spending almost 18 years on death row. “Stunning portrayal of the human drama lived by death row exonerees…a powerful and thought-provoking film” – David O’Sullivan, Ambassador of the European Union Delegation to the U.S.